Would you make a good ironworker? Take our career test to find out how you match with this and over 800 other careers. What is the workplace of an Ironworker like? Structural iron and steel workers install iron or steel beams, girders, and columns to form buildings, bridges, and other structures. They perform physically demanding and dangerous work. 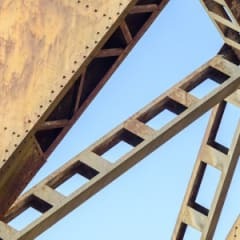 Iron and steel are important elements in buildings, bridges, and other structures. Even though the primary metal involved in this work is steel, these workers often are known as ironworkers or erectors. When building a tall structure, such as a skyscraper, ironworkers will arrange the steel frames, reinforcing bars, buckets of concrete, lumber, and other materials and equipment around the construction site. Once this job has been completed, workers begin to connect steel columns, beams, and girders according to blueprints and instructions from construction supervisors. As they work, they use a variety of tools. They use rope (called a tag line) to guide the steel while it is being lifted; they use spud wrenches (long wrenches with a pointed handle) to put the steel in place; and they use driftpins or the handle of the spud wrench to line up the holes in the steel with the holes in the framework. To check the alignment, they may use plumb bobs, laser equipment, or levels. Structural steel generally comes to the construction site ready to be put up, and cut to the proper size, with holes drilled for bolts and numbered for assembly. Some ironworkers make structural metal in fabricating shops, which are usually located away from the construction site. Are you suited to be an ironworker? Ironworkers have distinct personalities. They tend to be realistic individuals, which means they’re independent, stable, persistent, genuine, practical, and thrifty. They like tasks that are tactile, physical, athletic, or mechanical. Some of them are also investigative, meaning they’re intellectual, introspective, and inquisitive. Does this sound like you? Take our free career test to find out if becoming an ironworker is right for you. Ironworkers perform physically demanding and dangerous work. They usually work outside in all types of weather, and some must work at great heights. As a result, workers must wear safety devices, such as harnesses, to reduce the risk of falling. Nearly all ironworkers work full time. Those who work at great heights do not work during wet, icy, or extremely windy conditions.